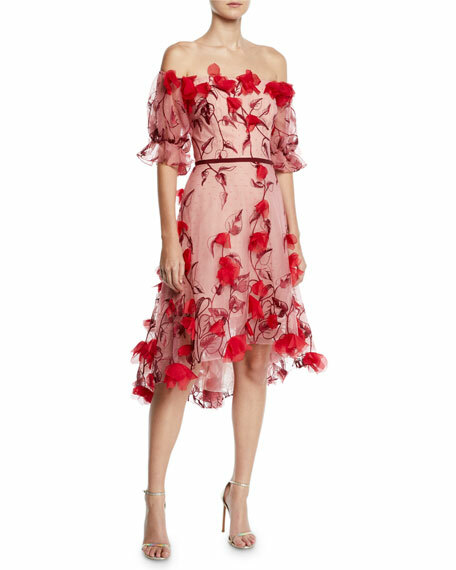 EXCLUSIVELY AT NEIMAN MARCUS Marchesa Notte cocktail dress in embroidered tulle with 3D flower appliques. Off-the-shoulder neckline. Half blouson sleeves. Slim band defines waist. High-low hem. Back zip. Nylon; combo, polyester. Imported. Model's measurements: Height 5'11"/180cm, bust 32"/81cm, waist 25"/64cm, hips 36"/91cm, dress size US 2/4. Marchesa Notte cocktail dress in embroidered tulle with 3D flower appliques.. Off-the-shoulder neckline.. Half blouson sleeves.. Slim band defines waist.. High-low hem.. Back zip.. Nylon; combo, polyester.. Imported.